The need to develop online courses based on proven best practices is indisputable. Over time, Quality Matters(TM) has emerged as the gold standard for online course design. The heart of QM Quality Matters(TM) is a 43-point rubric (Figure 1). It includes benchmarks in the areas of Course Overview and Introduction, Learning Objectives/Competencies, Assessment and Measurement, Instructional Materials, Learner Activities and Learner Interaction, Course Technology, Learner Support, and Accessibility & Usability. 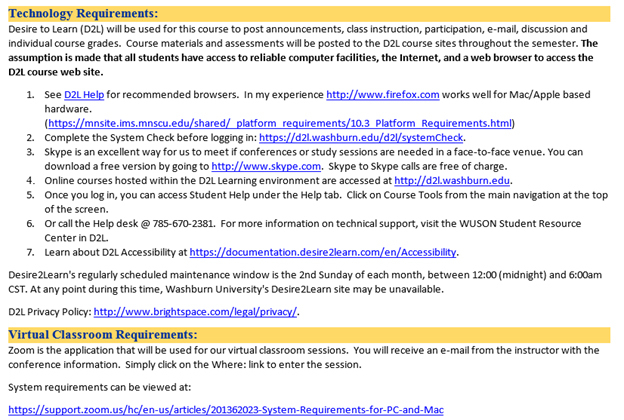 However, when an instructor is confronted with developing an online course based on these standards, it can daunting! 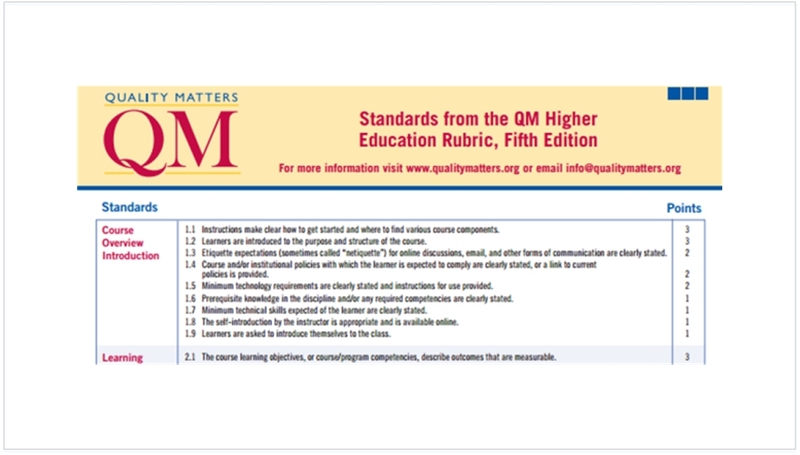 The Quality Matters(TM) rubric is developed from an instructional designer’s perspective, and the underlying concepts may be unfamiliar to the average faculty member. 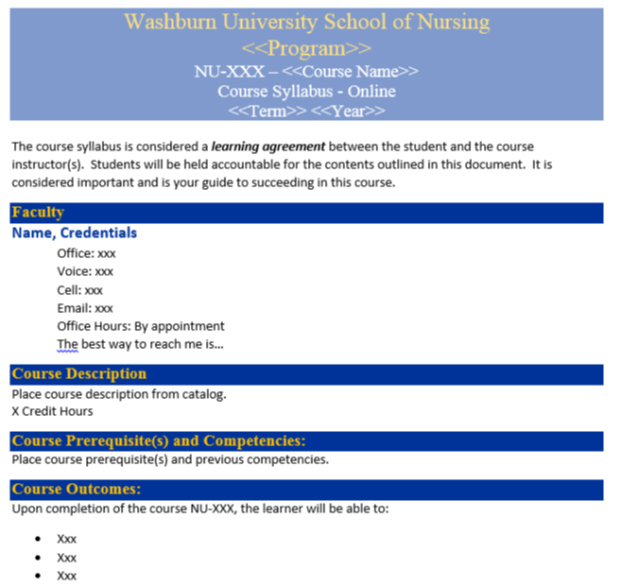 The School of Nursing at Washburn University is in the process of rolling out a fully online program for RN-to-BSN students. There are 15 courses in the program of 30 credit hours. A strategic decision was made early on to design all the courses to meet Quality Matters(TM) standards. One way to approach adopting the Quality Matters(TM) standards is to analyze each benchmark to see what is required. Our analysis showed that many of the features could be “canned” or developed so that they could be reused over and over again in many courses. In the School of Nursing, we adopted this approach. The reusable tools we developed are a Course Template for D2L, a Syllabus Template, and a Student Resource Center. About 37% of the QM benchmarks can be achieved by using these standard objects. To make it easier for Quality Matters(TM) reviewers to evaluate a course, a cross-reference of where evidence of a Quality Matters(TM) standard could be found within each of the standardized elements was also developed. 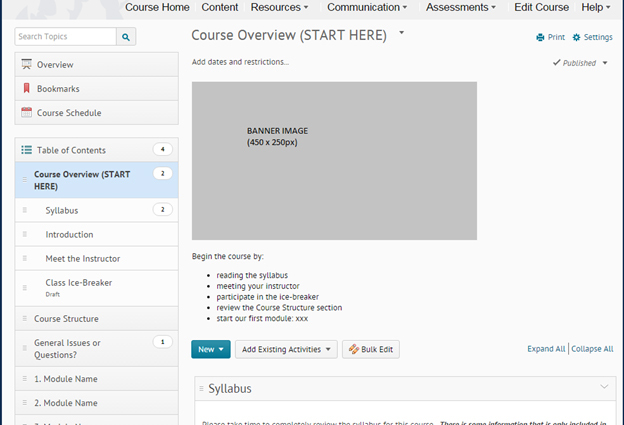 The course template in D2L provides students with a standardized experience about where to easily find information from course to course. It doesn’t mean that every course is identical, but that key features are consistently used. Consistency is a crucial characteristic of effective online course design. The next major component adopted was a standard syllabus template. One of the first things you’ll notice about this syllabus template is that is uses color. These are online students and color is free! An example of the syllabus template is available for download from the Faculty Support Center. The final standardized element developed was the School of Nursing Student Resource Center. When the Quality Matters(TM) standards were analyzed, it was observed that the Learner Support standards referenced university-wide services rather than course specific items. 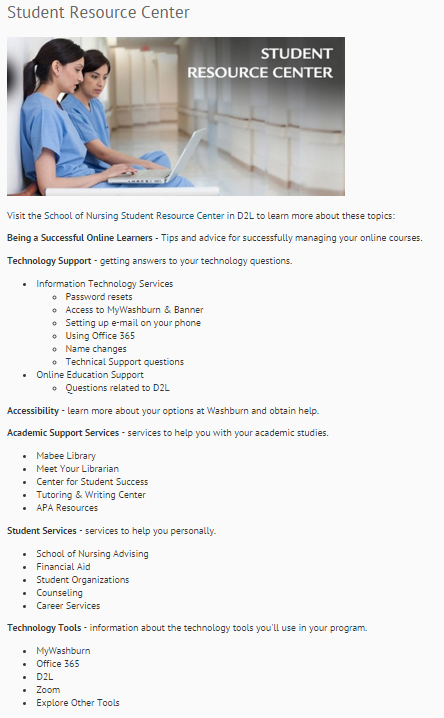 The Student Resource Center was developed to address and provide access to these university-wide services (Figure 6). Overall, the response to the standardized elements has been very well received by both instructors and students. The instructors like the professional presentation. From an instructional design perspective, it saves about 8 hours of effort versus starting a new course from scratch. It allows an instructor to focus on the actual content of the course rather than the mechanics of setting one up. The format/outline is clear and comprehendible (sic). Clear date/time for assignments turn-in. I love the navigation of the webpage. It give me an overview of everything I need to get done. I like the consistency between each module. I like the “content” tab and layout. It helps me stay organized. I enjoy seeing the outline of the course. It helps me stay on track. The Student Resource Center is rarely used, but those students who did use it spent a lot of time in the Being a Successful Online Learner section. In review, it may be beneficial to talk more about this resource in the students’ orientation. These standardized elements were originally developed for the RN-to-BSN program in the School of the Nursing. There are four other programs in the school, and as new online courses are being developed in these other programs, they are electing to use the standardized elements as well. You've done a great job of providing introductory material and your content and objective mapping is among the best I've ever seen. Overall, this is a very well-designed and easy to navigate course. This course has many great attributes worth emulating! This course has very well thought-out and carried-out delivery design. It was a pleasure to review. It was very user friendly and visually appealing! In summary, the strategy to develop and adopt standardized elements has made the process of getting courses Quality Matters(TM) reviewed successfully much easier to implement and manage. Linda Merillat's experience and skills represent a union between technology, education, and interaction design. In the course of her career, she has played many different roles: programmer, systems analyst, business analyst, interaction designer, program manager, project manager, consultant, trainer, educator, instructional designer, researcher, author, and entrepreneur. The common thread running throughout has always been the challenge of how to successfully use and integrate the latest technology into an organization. 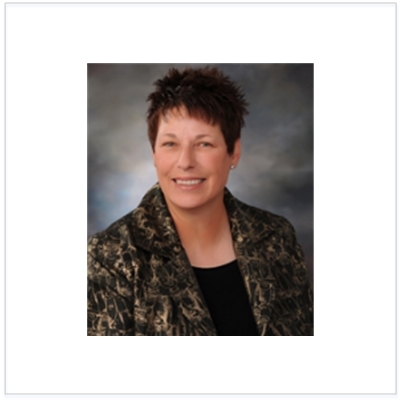 Dr. Merillat currently holds a faculty position with the School of Nursing at Washburn University in the role of Instructional Designer. 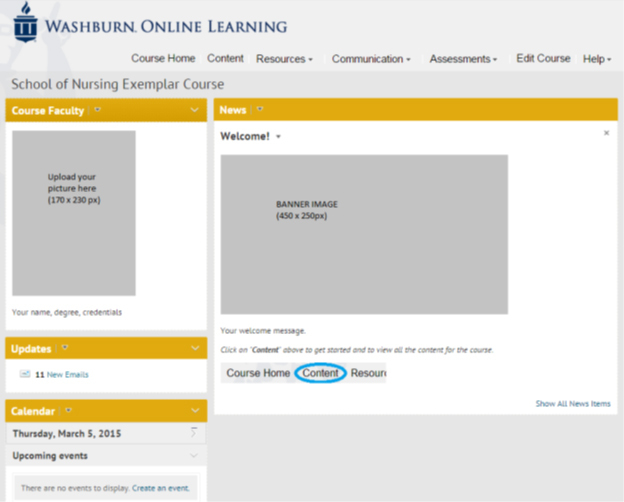 Jeanne Catanzaro, Ed.D., R.N., is currently the Director for the new online RN to BSN program at Washburn University School of Nursing in Topeka, Kansas. This program began January 2015 to provide an opportunity for Registered Nurses with Associate Degrees to complete a Bachelor of Science in Nursing degree. Entirely online, the program is perfectly suited for the adult learner, working full-time to attain a 4-year degree. The program can be completed in 18 months part-time or 12 months full-time. Jeanne has been involved in online education for 10 years. As the program director, she believes all students should have access to affordable, innovative, and well-designed course content in order to meet their learning goals. 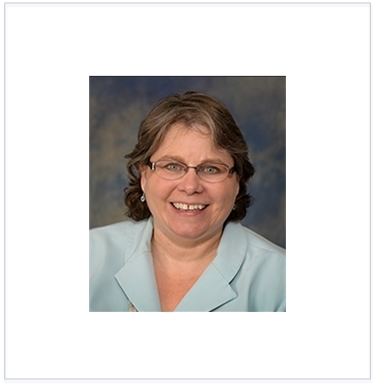 Dr. Catanzaro holds a BS in Nursing from St. Louis University, an MS in Nursing from University of Missouri – Kansas City, and is completing her doctorate in Educational Technology & E-Learning from Northcentral University. Discussion of "Using Standardized Templates to Meet Quality Matters(TM) Standards"
Version 17 id 779020 of this page, updated 06 June 2016 by Shalin Hai-Jew. Created by Shalin Hai-Jew.